On our recent trip to Arizona, we found these little fellas everywhere. There were probably thousands of different kinds of cactus….(cacti??) 🙂 A lot of people have ornamental cactus in their yards as well. You certainly know you’re in Arizona when you see the signature Saguaro species – the tall, tree-like plants that grow “arms” as they age. I was amazed at how different these plants were. Some were really tall; others shorter. Some had large, curved “arms” while others had little knobs. Some were a little less “prickly” than others but all stood strong in their element. Sometimes I feel like one of those Saguaro plants. Sometimes I feel tall and strong and like I have it all together. Then other times, I feel dry and prickly. I feel like I need rest, water and a break from the heat of the world weighing down on me. I need to change from the weight of negativity to the hope of a positive future. I realize just like all plants that I need a little water; a little Living Water. I need to take time to rest, to pray, to dig into God’s Word to see what He has for me today. And when I take time to rest and pray and study, I feel His presence slowly take away my dryness and my prickly attitude. I feel a sense of renewal and peace and calm. I feel the negativity being replaced with positive hope. The world is crazy, ya’ll!! 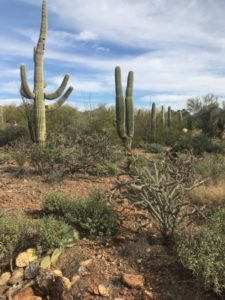 I know you know that, but unless we keep getting our lives filled up with some spiritual food and water, we are going to turn prickly in the desert season. That is not a fun place to be. This entry was posted in devotional, inspirational, motivational, spiritual on February 4, 2019 by Deanna Young.